This morning I think I saw the worst case of a London Underground sleeper ever. 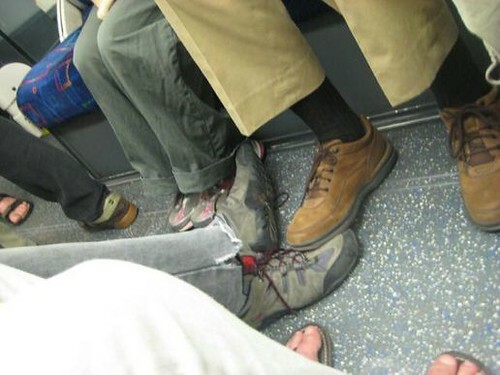 There was a guy on the Piccadilly Line who was completely sprawled out with his feet going right across to the people on the other side. Luckily I was able to grab the seat that was next door but one to him, unlike my unlucky fellow commuters. You can also see from the picture above that he didn't even stir when someone opposite actually rested on his foot. (Although he must have been oblivious to the fact that he was using someone else's foot as a ... err... footstool). Sleeping guy spent the vast majority of the journey falling asleep on the men on either side of him. They tried to wake him up by giving massive shrugs of their shoulders, but Sleepy was out for the count. He'd sit up for a nano second and then fall asleep on the other guy. To his credit he gave them a bit of respite by occasionally lolling with his head back, so it hit the window a number of times. That didn't wake him up either. I got off the Tube as normal, but wouldn't be surprised if the poor guy slept until Cockfosters. If ever there was a case for the "Wakemeupat" stickers, this was it. Although I have no idea what kind of shaking it would have taken to have woken him. Want to be a Tube Busker? 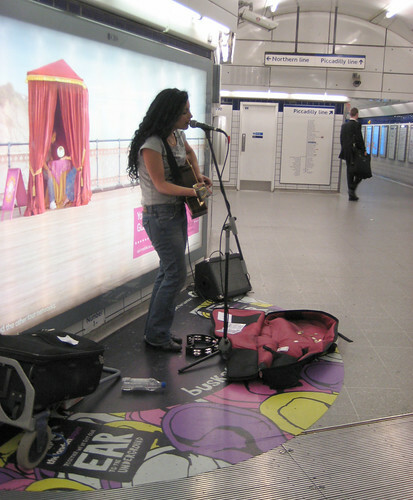 Budding young Buskers can get the chance to win a 20 minute on a prime performance pitch on the London Underground. On Saturday 11th July 100 musicians aged between 16 and 25 will take part in an event called "Rhythm of London". To take part, you need to send a 30 seconds - 1 minute (max) film/video of you or your band playing to Rhythm of London Audition Team. A panel of judges will judge will select the top 100 performers, then the top 10 buskers will go to a public vote. It what will be a "busk off" or "Strictly Come Busking Idol X Factor" final, the overall prizes include a year's licence to busk on the Tube, plus a guitar signed & donated by Sting. Deadline for entries is noon on the 6th July. Even though there's still no official sponsors for buskers on the Tube, this competition shows that buskers are still backed by Transport for London. I'm still surprised that an official sponsor hasn't been found to replace thelondonpaper and Capital.fm who were last behind the buskers. Surely there'd be some music company that could get some benefit from advertising on the spots that millions of people pass each day? I only heard about Michael Jackson's death on the radio this morning, which was a massive shock, specially as I didn't hear it in a news item and was half asleep. He was a big part of my childhood and this video of a group of dancers on the London Underground last year is small tribute. It was to mark the 25th anniversary of his Thriller album. RIP Michael, you'll be missed. For years, I've been collecting overheard unofficial announcements made by London Underground drivers, well now it appears that we'll hear something a little more thoughtful than Mind the Gap. Transport for London have asked artist Jeremy Deller to come up with a list of quotations to put into drivers' communications with passengers. 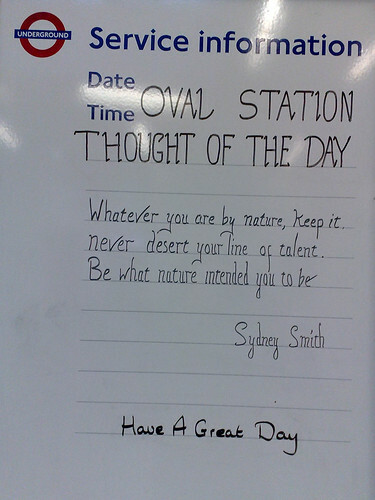 It appears to be like the Thoughts of the Day on the whiteboards we've seen on some Tube stations. Satre, Gandhi and Einstein are some of the great thinkers you'll be hearing on your journey. The quotes include "An ounce of action is worth a ton of theory" and "A stumble may prevent a fall" to the more philosophical "The afternoon knows what the morning never suspected". I wonder what bought about this change of heart? What do you think of the announcements and have you heard any yourself yet? The lady at the end of the BBC piece about the announcements, thinks they're a good idea but says that she'd be driven mad by them if there was a quote at every stop on a daily commute. Wired magazine brought out a UK version of the popular US publication a couple of months ago, and they appear to have an inner Tube geek. 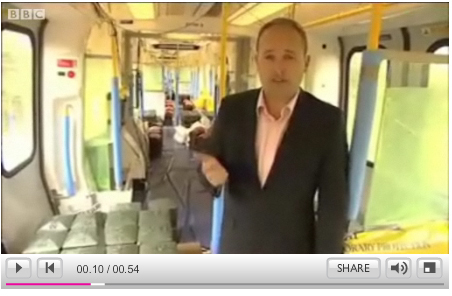 They sent a reporter to Euston station to see what happens to the London Underground overnight. Thanks to John W for sending me the link. He felt the delivery of the piece was a bit patronising. I know what he means. For Wired I was expecting something a bit more hard-hitting or at least with a more curious bent or maybe even something that delved into some unusual technological discovery or secret that no one knew about. I suppose the problem with filming anything when you're invited in at a time when no one else is around, is that you'd have to get Tube Lines to clear the film & "in the current climate" anything hidden or secret would need to be kept exactly that. I know from personal experience that you more or less have to give Tube Lines your blood group, mother's maiden name & a lot of other personal details to get underground out of hours! Still if you'd like to see a short piece about some of the engineering & cleaning work that goes on in the small hours, it's does the job! Let us know what you think. Trials of the new air conditioned London Underground carriages are taking place up in Leicestershire today. 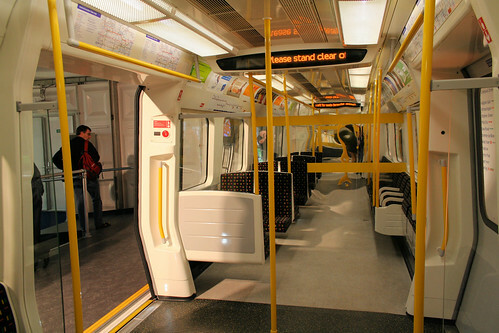 The BBC reporter is filmed showing temperatures on board at around 17 degrees centigrade, so that will be a relief for many commuters when they are rolled out on the Metropolitan Line in September 2010. The trials are expected to finished by the end of this year. Then, all going well with the Metropolitan launch, the new stock will then be released on the District, Circle and Hammersmith & City lines. Not only will the new S stock be cooler, the trains will be larger and longer with capacity increased by nearly 20%. Roll on the launch, although cooling deep level lines like the Northern and Victoria will still be challenge. You've probably seen pigeons using the London Underground & there's a number of theories around as to whether they are travelling with intent. 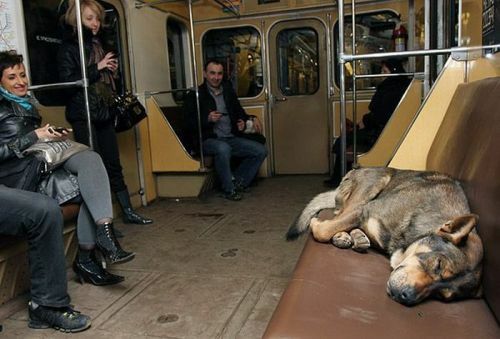 Thanks to Jon Justice, I found that in on the subway in Moscow there are a number of stay dogs who are so smart that they get the Moscow Metro into the centre of the city in order to secure better food. And then ride it back out to the suburbs at night. English Russia website said "Moscow ecologists think that dogs started acquiring this habits in 1990s, when the Soviet union collapsed and Moscow fell into the hands of new class of Russian capitalists." The homes that they used to shelter in were removed to the outskirts "so the dogs had to move together with their houses, so they had to learn how to travel Moscow subway - first to get to the centre in the morning then back home in the evening, just as us people." They certainly seem at home on the subway and if you look at the video at the end of the post, some of them seem, well..... a little too much at home. 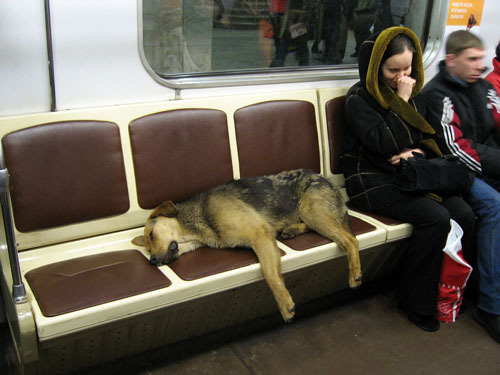 Fortunately I don't think there are enough stray dogs around London to see them using the Tube by themselves. I could imagine that cats would be sneaky enough to give it a try, but as they're not as social as dogs, I think we can rest assured that our feline friends won't be cat napping on the Tube with us. Any more pictures like this are more than welcome to add to the cheerful ones at Warwick Avenue. Later today union leaders are going to meet London Underground for talks to stop another round of Tube strikes. The dispute is over job losses, pay and disciplinary issues. There was some argument as to whether a pay deal was actually reached last time, with both sides accusing each other of pulling out of the deal at the last minute. RMT leader, Bob Crow or BoCro accused London mayor Boris Johnson or BoJo of "playing politics" with the Tube by deliberately intervening to scupper a last-minute deal. BoJo retaliated by saying that allegation was "completely untrue". "This latest package of £60million cuts nails those claims as a bare-faced lie. 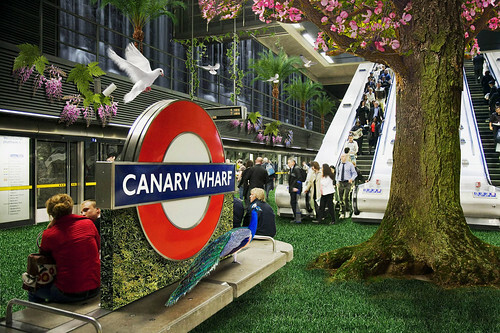 Londoners need to wake up to what's going on with the financial crisis on the Underground." London Underground's interim managing director, Richard Parry, countered this and said "There is absolutely no truth in the RMT leadership's claims that we have reduced safety standards on former Metronet lines. "London Underground has an excellent and improving safety record. The safety of our passengers and staff is our top priority." While the arguments and counter arguments, claims and counter claims go on, let's hope that something gets resolved this time. If you were hit by last week's London Underground strike you can apply for a "goodwill" payment voucher from Transport for London. You can only get one if you were holding a seven-day or longer period travelcard on Oyster at the time of the strike. This is the first time I can remember something called a "goodwill" voucher being offered, so make the most of it and spread the word. Your journey had to be "severely disrupted" and you don't have to wait until your ticket has expired before applying for it. Full details and the online application form are here. 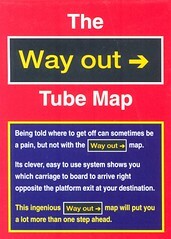 I used the swear by the Way Out Tube Map (swear by in a good way that is). It was a map that showed you where to get on to get off, or rather which carriage to get onto if you wanted to be nearest the exit when you left your London Underground journey. I've actually lost my well worn copy now and for new users it was fairly complicated. Today there's a brand new app - Tube Exits - launched for the iPhone which takes the principles in the Way Out Tube map and made it a whole lot easier. Tube Exits' creator Lance Stewart said "I found it frustrating arriving at a station and being at the wrong end of the platform behind the crowds, but loved it when the train would arrive perfectly adjacent to the exit I was looking for. I thought this doesn't need to be put down to chance any longer so created Tube Exits to help solve this problem. And yes, I did go to every station, most in-fact twice!" Before you ask it does work underground, so you can plan your journey without an Internet connection, and work things out on the escalator or while waiting for the train on the platform. The promo video has music from Ben Phaze using underground sounds. You can also save your favourite journeys and also access your reverse journeys with one touch. Although with regular journeys you'll probably remember which carriage to use after a while, and I found the map or apps like this, more useful for new journey. Every station on the London Underground (Zones 1-9) is covered and there are already plans for more versions of the App covering different cities around the world. Tube Exits is available for iPhone and iPod touch on the iPhone App Store. There's an introductory price of £1.79 (40% off £2.99 normal price) so it's about the cost of a single zone 1 Tube journey. If you give it a try, I'd love to know what you think. If you want to see what the London Underground looked like in the second world war, it's worth popping over to Colindale station this weekend - 20th - 21st June. 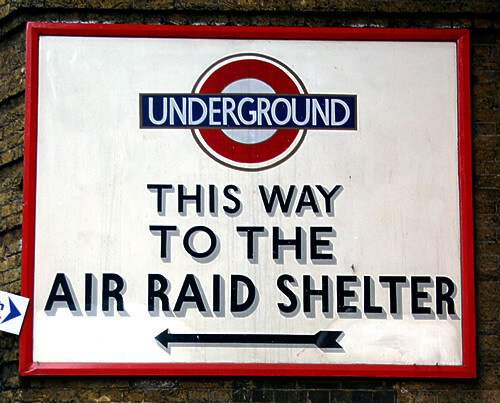 "The entire station will be placed on World War II footing with staff in period costume and the station dressed in full 1940s regalia with sandbags, watch tower and a display showing how London Underground kept the capital moving during the war." Handy if last week's Tube strike gave you that "let's all pull together, spirit of the blitz feeling". While you're there, you can visit the nearby RAF Museum to get into the full war time swing of things. "The Hendon Pageant takes the theme of Summer of 44 -The Flight Path to Liberty. There will be a chance to meet re-enactors and view military vehicles, fire engines and ambulances from the period. Special tours, talks and interactive workshops will also be taking place. Learn First Aid 1940s style courtesy of St. John Ambulance, enjoy rousing music and swinging beats with our 1940s concerts, meet the Land Girls, Air Raid Wardens and members of the Service and learn what a normal day was like for these individuals in 1944." Thanks to Ianvisits for the heads up on this. There's more details on the following page, but please note that tickets for the 1938 tube ride are now sold out. Although you'll still be able to see the trains making the journey from Edgware via the Kennington Loop to Colindale station. As negotiations continue with both the RMT and London Underground blaming each other for the break down in talks, it's good to know that seven of the eleven Tube lines have some service. Bear in mind that although the strike officially ends at 7pm tonight, you can expect disruption to the service until tomorrow morning. However, the good thing is that many Aslef drivers turned up for work and some of RMT's own members broke the strike and reported in for duty. 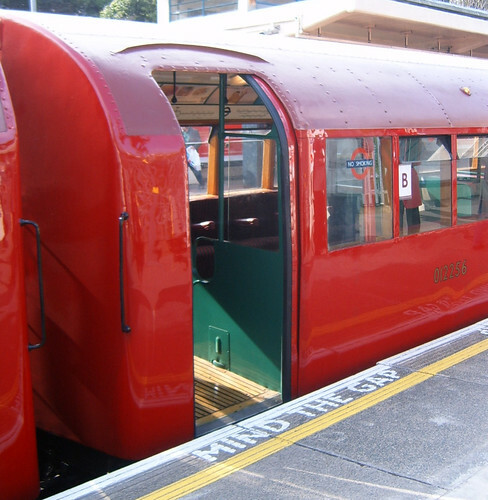 Aslef, which represents 2,000 tube drivers, said that the strike action was inappropriate when progress was being made in negotiations. Aslef's general secretary Keith Norman said "Our members are not involved in this dispute. We believe it can be solved through negotiation. The fact that so many Aslef drivers have turned up for work is highly significant. In the past they would have refused to cross picket lines". In the meantime people have been using the net in various ways to cope with the strike. 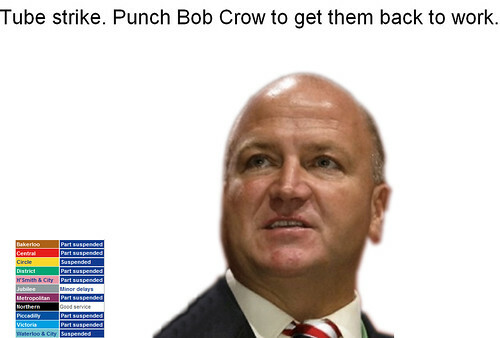 There's was a Punch Bob Crow page if you want to give the RMT leader a thick ear or a black eye (sadly the link doesn't work anymore & has been taken over by some spam). More positively, Paul Clarke was ferrying Londoners about the city for free rides on his motorbike. He set up something called Tweetbike on Twitter and was taking requests for riders across the city, as they tweeted him for rides using the hashtage #tweetbike. Lisa Deveney described her ride to the BBC. The good thing was that London wasn't bought to a standstill and commuters and many staff did their best to get into work and get people moving. Good luck on your journey today and I'd like to thank all of the staff who crossed picket lines to get things moving yesterday and today. Hopefully once BoJo and BoCro stop blaming each other for talks failing, stop talking about talking and sign some deal, we'll get back to normal. So just when most of us thought the current London Underground strike was all about pay, it appears that the latest pay deal which TfL offered was accepted but at the last minute RMT union leaders demanded the re-instatement of two sacked drivers. One driver was sacked over opening the doors on the wrong side of a Victoria Line train & then lying about carrying out safety checks and the other was sacked for theft. Peter Hendy, Transport Commissioner said "We believed we were making progress until last night (Monday night) when the RMT said 'We'll strike unless you reinstate our sacked members'. 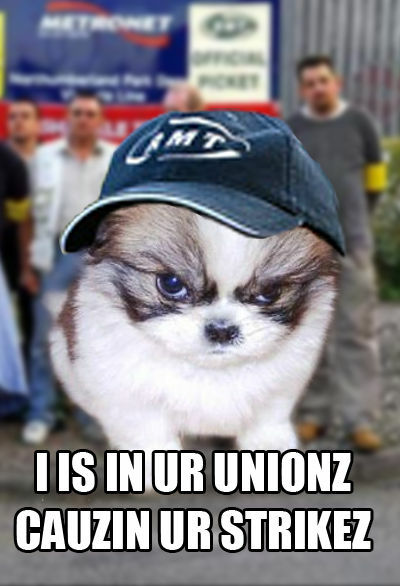 That the RMT should cause chaos for no good reason is outrageous. We want to go forward, not back, and striking isn't the way to do that". At time of writing, there is nothing on the RMT's site about the reinstatement of the drivers or about TfL meeting them with a pay deal they were happy with. Like the commenters on yesterday's post I wonder how many RMT members would have gone on strike purely because of the two sacked drivers? Was this even one of the questions tabled as part of the ballot? Have RMT senior members stretched the "yes" vote to include this new element? 10,000 staff were eligible to vote, 2,810 supported strike action with 488 against. The remainder did not vote, reported The Evening Standard. How would this strike had gone if all factors were on the table? I guess we'll really never know. 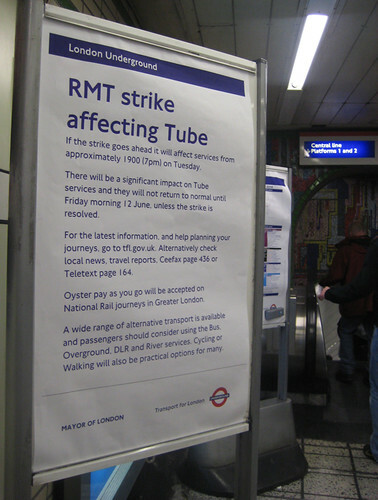 Some workers may decide to cross picket lines and carry on working as normal, so there may be a chance your line or station is operating. For now, as the notice at my station last night said, keep a close eye on the TfL website and listen to local news to see how you'll be able to get into work today. The Northern Line and Jubilee lines seem to be offering the best service (with a few stations closed on them), but the Bakerloo, Central, Circle, Hammersmith & City, and Waterloo & City Lines are completely suspended. Other lines are running a partial service with some stations on those lines completely closed. The situation is changing all the time and TfL are aiming to get more stations open, so check before you leave home. 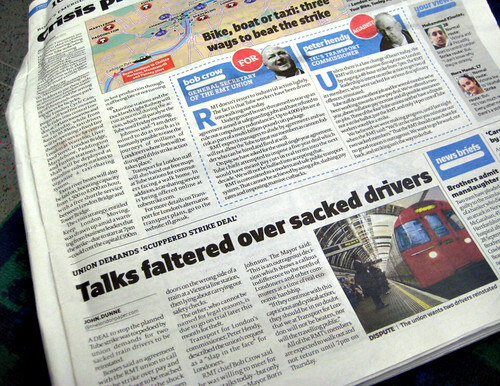 London news media properly investigate why industrial relations on Tube are so bad. 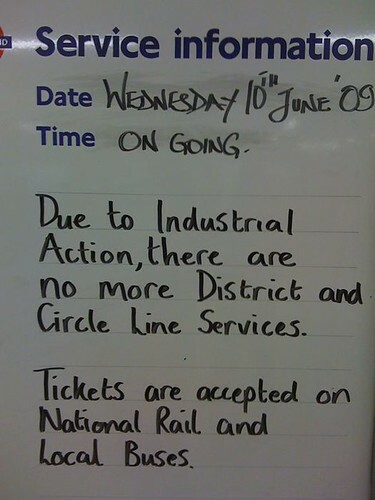 (a shot of… hang on, that’s just taking the piss)"
After 10 hours of talks, the 48 hour London Underground strike will be going ahead from 7pm tonight - 9th June. Although it will end on 18:58 on Thursday 11 June, it's expected that services won't really get back to normal until Friday morning. Transport Commissioner, Peter Hendy said "The RMT's leadership has shown yet again that no matter how far an offer is made, they would rather strike than talk. "Their attitude is a slap in the face to all hard-working Londoners and businesses struggling through a deep recession." He continued: "the impact on Tube services is likely to be significant..... A massive effort is being made including boosting bus and river services, providing escorted commuter cycle rides and more central London cycle parking, and distributing thousands of walking maps at central London rail and Tube stations. "Pay as you go will also be accepted on all National Rail services within Greater London and there will be marshalled taxi sharing facilities at six major rail stations." London Overground and Docklands Light Railway services will be operating as normal. But the congestion charge will still remain in operation. The mayor's approach to all this is to tell people to get on their bikes. There will be led cycle rides with TfL volunteers providing maps, guidance and refreshments for five escorted rides. Full details are on a new website "Bike the Strike". On the river boats, existing services will be boosted from a capacity of 1,500 to 8,000 an hour and will include an additional free shuttle service from London Bridge to Tower Bridge. TfL made a new four year pay deal of 1.5% this year and then the inflation rate plus 0.5%; or a two-year deal of 1% now and inflation plus 0.5% in year two. However this wasn't good enough for the RMT who want a 5% pay rise and a promise of no redundancies. RMT leader Bob Crow said "Not only could the management side not reach an agreement on the kind of deal needed to end this dispute, they also found it difficult to stick to existing agreements on redundancies. "The strike will now go ahead and we expect it to be solidly supported." Whether it is solidly supported remains to seen, but we can definitely expect massive disruption to the service. Keep an eye on the TfL's website before you travel and good luck with your journey over the next three days. 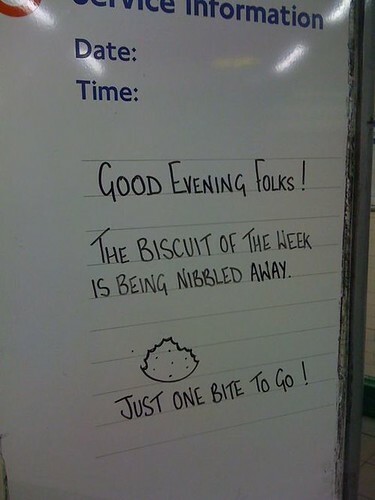 The guys from Warwick Avenue London Underground station are at it again, with their positive little messages and cartoons to cheer commuters up on their journey. Kapi said of their daily message that it "Never fails to bring a smile to my face." 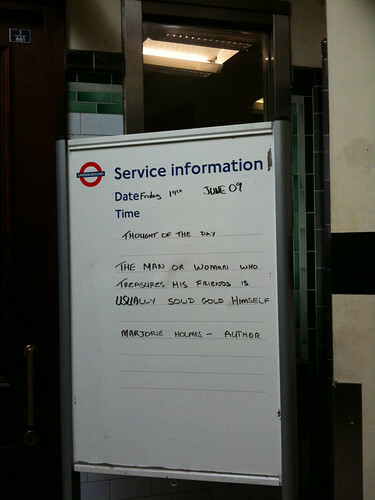 I'd guessed it was Warwick Avenue Tube because of the cheese photo that I'd previously blogged. Kapi said of the guy in the photo that he's: "The nicest man, he was actually wishing everyone good evening as they passed by." I always love seeing Tube staff showing that the system is run by real people and that some staff want to make a small attempt to brighten up a daily commute. Today at noon there will be more talks between the RMT and London Underground in an attempt to stop next week's Tube strike. 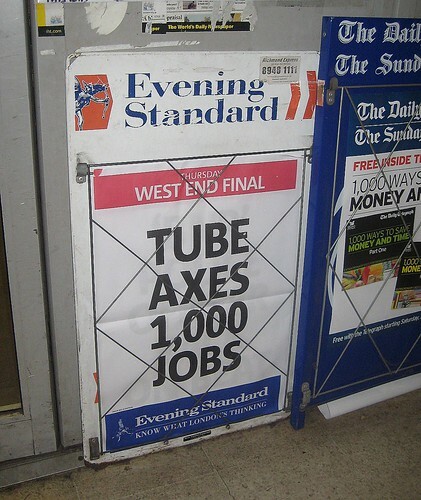 Bob Crow said "We hope that the Mayor, who was full of praise for his transport staff earlier this year when they struggled against the snow to try and keep London moving, will issue a clear mandate to his senior staff to lift the threat of pay cuts and compulsory redundancies and to rebuild the industrial relations machinery on the tube." Although Dave Hill from The Guardian wouldn't count on Boris's help here. The RMT seem desperate to pull out all the stops with this strike and I've been sent a memo, which I believe to be true, of the RMT attempting to get ASLEF members to join them during the strike. 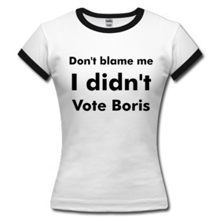 It also doesn't seem to hold much of an opinion for Boris either. 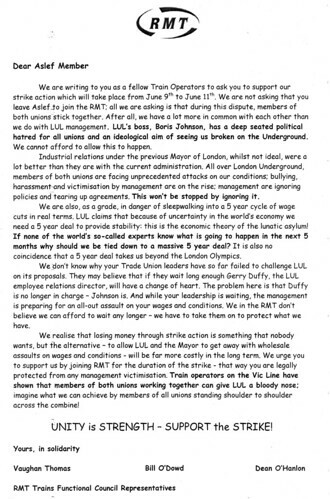 "LUL's boss Boris Johnson has a deep seated political hatred for all unions and an ideological aim of seeing us broken on the underground" is highlighted in bold lettering. It's worrying if this is a serious suggestion that members of another union should change their allegiance temporarily to support a strike that ASLEF members have not had an opportunity to vote on? It sounds very desperate and I wonder if it's even legal. You can see the memo in full here, and I'd very keen to hear your views. Either way very interesting times ahead and we'll see what today's talks bring. UPDATE - New offer from LU - Just heard the following from The Guardian's Dave Hill - "London Underground has today tabled what I'm told is a "fresh pay offer" to the RMT, Aslef and the TSSA. It covers two years instead of the five previously proposed and which the RMT rejected. It also proposes setting aside matters relating to the Olympics for now with a view to separate discussions. LU Interim Managing Director Richard Parry says, "There is now no reason whatsoever for the RMT leadership to continue to call for strike action next week." Bob Crow says, "The talks have been adjourned until Monday. Both sides will now consider their position and will get back around the table at 9.30 on Monday morning.."
Thanks also Dave for linking to the RMT memo above! Looks like hopes of next week's strike on the London Underground being called off are slim, as Bob Crow said "Industrial relations with TfL and LUL have completely broken down". The union leader accused TfL of "rank hypocrisy" in rejecting rejecting a 5% pay rise request while paying 123 TfL managers more than £100,000 a year. The RMT's recent press release states "The pay figures show that five TfL/LUL chiefs earn more than a quarter of a million pounds a year plus bonuses. Fifteen TfL bosses, including the director of marketing, earn more than the Prime Minister." Despite Crow's claims of completely broken down relations, TfL say they are still ready to talk at any time to try to avert the strike. A spokesperson said "Rather than pay cuts, TfL's offer actually guarantees LU employees real pay increases each year for the next five years - few Londoners can claim the same level of security. "It has already been announced that TfL senior managers will see their salaries frozen this year. "The RMT leadership should start talking to us rather than threatening strike action that is supported by less than 30% of their membership, will lose their members pay and will cause unnecessary frustration and disruption to Londoners." 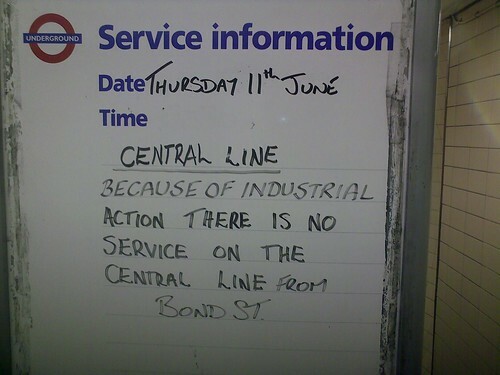 Who knows there may be a last minute break through, but it's unlikely, so get prepared for 48 hours of no Tube from 7pm on Tuesday 9th June, running through to 7pm on Thursday 11th June. To celebrate the Jubilee Line's 30th birthday, some limited edition prints are being given out at certain stations from 7am - 12pm today - 2nd June & the 3rd June. 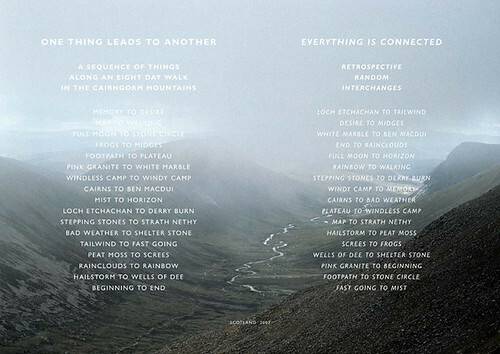 The print by Richard Long is called One thing leads to another – Everything is connected and "contrasts the diverse landscape that the Jubilee line travels through, from Stanmore to Stratford, with the rugged landscape of the Cairngorm Mountains in Scotland, which was traversed by Long on foot on one of the many walks he has made as an integral part of his art." The prints are available at Stanmore, Wembley Park, Finchley Road, Baker Street, Green Park, Westminster, London Bridge, Canada Water, Canary Wharf and Stratford London Underground stations. 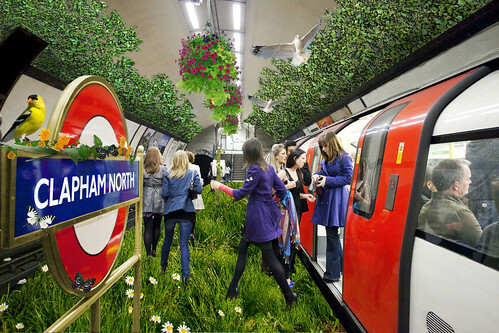 Full details are on the Tate Britain's website & Transport for London's Platform for Art. Thanks to Jemimah Knight for the heads up on this. tubeupdates.com was developed by Ben Dodson who said: ""Ever since the Transport For London site was updated, I've wondered why they didn't provide a basic way of accessing their data which so many developers could make use of. I expected that they would have an RSS feed of the tube status updates but instead the only way to access this information was through a set of pre-built widgets. Not any more." My idea was to have a fully featured REST-ful API that would allow any developer to instantly query what state the London Tube network was in. As a bonus, this would include the Docklands Light Railway and if possible would feature the individual messages that each line has in order to specify exactly why there is a delay or if any stations are closed, etc. A distant dream was to be able to search back through the various status changes over time so that other developers could build applications such as reliability graphs or time checkers." When number of bloggers & myself met TfL last year we asked why their API wasn't open to developers, so it's good to see that people are trying to handle what little data is open to people. Surely some tools like this on their website or working closely with developers (many of whom have a lot more time their hands in the current economic climate) would benefit everyone? Who knows it may happen in the future. But in the meantime while away some time seeing how reliable your line is, & feel free to get in touch with Ben if you've got any questions on the tool. Quite a number of us will be walking into work if next week's Tube strike goes ahead, and this is just a quick reminder of train operator, Edward Spencer, challenge. 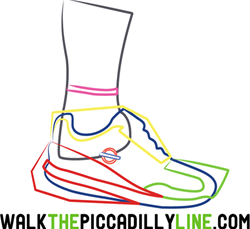 He'll be running the entire length of the Piccadilly Line this Saturday to raise money for the NSPCC. He said "You can find out about the blood sweat and tears (all mine!) and see some of the training runs which I linked to on my website"